Identical twin sisters Bao Nhia Julia Yang and Bao Kou Julie Yang have shared a lot over the years, and now their daughters will share the same birthday. The sisters gave birth hours apart on Sunday night, ABC Fresno affiliate KFSN reported. Twin sisters Bao Nhia Julia Yang and Bao Kou Julie Yang gave birth on the same day in Fresno, Calif. But even though they grew up doing everything together, including dressing alike, the twins told KFSN they did not plan on having babies at the same time. "I found out I was pregnant first and then I told her. She told me she might be pregnant too," Bao Kou Julie Yang told KFSN. 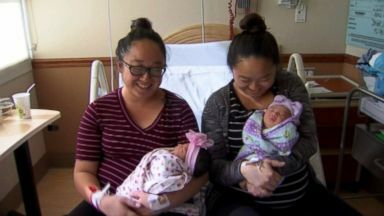 The sisters' due dates were actually two days apart, but both women went into labor around the same time at the Community Regional Medical Center in Fresno, California. They welcomed their daughters Candra Thao and Nadalie Xiong about two hours apart. Bao Kou gave birth to baby Nadalie first at 6:59 p.m., while Bao Nhia welcomed baby Candra at 8:48 p.m., KFSN reported. Laura Schleicher, a certified nurse midwife, delivered both of the twins' babies, the hospital told ABC News in a statement. Schleicher said she has worked in labor and delivery and midwifery for almost 40 years all across California and has never seen this happen. "All I did was deliver them. They just had great timing, very unique timing," Schleicher said. Bao Nhia, who already has children, shared her advice for her sister, who is a first-time mom. "She's going to need a lot of rest because the baby will be crying," Bao Nhia told KFSN. The hospital also offered the twins the opportunity to share a room after giving birth, according to KFSN.